PietraCasa based in Poole, Dorset are proud to be registered dealers for Florim.For further details regarding any of PietraCasa's beautiful porcelain tiles or to speak to one of our experienced team representatives for additional information, please click here where you'll be asked to fill in a short online contact us page along with details of how to locate PietraCasa directly on google maps. Alternatively, you can call us directly via tel: +44 (0)1202 618 155. The Bas Relief collection for Mutina has been created by renowned designer Patricia Urquiola. These exceptional tiles offer artisan-produced work of different variations and depth with influences and traces of the past. The handmade collection was created specifically for wall use and the Bas Relief tiles come to life in distinct versions and dexterity. The Bas Relief collection is seen in natural colours and they are all unique from one another in their texture and finished look. Each patterned tile is handcrafted giving a slightly irregular edge of the tiles themselves and a natural distinguished finish. PietraCasa based in Poole, Dorset are proud to be registered dealers for Mutina. For further details regarding any of PietraCasa's beautiful porcelain tiles or to speak to one of our experienced team representatives for additional information, please click here where you'll be asked to fill in a short online contact us page along with details of how to locate PietraCasa directly on google maps. Alternatively, you can call us directly via tel: +44 (0)1202 618 155. When clients asked us what the largest format porcelain tile we supply is, their mouths tend to drop ajar when they find out it’s actually 160cm x 320cm’s. You might say it’s difficult to imagine how a porcelain tile could be so vast not to mention how it is handled when hanging your preferred large format tile to a wall or laying it correctly in place on the floor. Our large format porcelain tiles offer contemporary sophistication and ostentatious luxury to larger spaces whether they are for a kitchen, bathroom or entryway to a commercial or residential property. Large tiles increase a feeling of space alongside modern ambience and a seamless consistency throughout the design. Are Large Format Porcelain Tiles better than smaller format porcelain tiles? Well it’s entirely up to personal preference and space requirements. As the tile increases in size, the amount of grout joints decrease therefore the amount of grout required is significantly less, however, the grout that surrounds a smaller format tile offers definition and colour balance. The focus is then on the tile itself and the personalisation of its size and shape. The variation of porcelain tile sizes we supply here at PietraCasa offer each client a solution to the space they wish to display as well as an opportunity to put their own stamp within the proposed design. For many people, home is the only place where they can truly be themselves therefore it’s imperative that we get it right the first time and let the client decide whether large or small format tiles accommodate their desired spaces. Here at PietraCasa, our tiles are suitable for commercial & residential projects. For further details regarding any of PietraCasa's beautiful porcelain tiles or to speak to one of their experienced team representatives for additional information, please click here where you'll be asked to fill in a short online contact us page along with details of how to locate PietraCasa based in Poole, Dorset. Alternatively, you can call us directly via tel: +44 (0)1202 618 155. Antique Marble is a classic collection from the Cerim range made by Florim in Modena, Italy. Following the success of Cerim’s “Timeless” range, they present another six marble essences that blend the classic and contemporary style together. The infusion creates a stylistic shade for modern and functional environments. The association of past and present in the Antique Marble range also sums up the purity and beauty of this natural material along with the characteristics of its creation and the practicality of porcelain stoneware. Here at PietraCasa, we supply and sell the entire Antique Marble collection by Florim. For further details regarding any of PietraCasa's beautiful porcelain tiles or to speak to one of their experienced team representatives for additional information, please click here where you'll be asked to fill in a short online contact us page along with details of how to locate PietraCasa directly on google maps. Alternatively, you can call us directly via tel: +44 (0)1202 618 155. Here at PietraCasa, we recently held our first event in conjunction with Montolit and the Society of British & International Interior Design (SBID). Montolit were here for a hands-on tutorial and demonstration for tilers from the local area as SBID introduced students, designers and architects to the benefits of porcelain. Meanwhile, PietraCasa and our friends Just Meat fired up the BBQ to show that work and play aren’t mutually exclusive! Brevetti Montolit Spa is one of the world’s foremost companies in the design, production and sales of various lines of electric and manual machines for working porcelain and related materials. After small beginnings from the back-room workshop of Vincenzo Montoli in 1946, Montolit has grown to having over 500 products in their catalogue, such as their best-selling Masterpiuma P3 manual tile cutter. Montolit’s representative, Filippo, led the tutorial and demonstrations for a small group of local tilers who were keen to learn more about the technical capabilities of Montolit tools but also to understand more about the behaviour of large-format tiles and best practice when working with them. Alongside Montolit’s tile cutting expertise were KTM Design, representing SBID. KTM Design launched in 2015 close to PietraCasa in neighbouring Bournemouth and they provide innovate design solutions to both domestic and commercial projects. Katie Thomas is the South West Regional Director for SBID and Director for KTM Design and was at the event to discuss with designers, architects and students the potential of porcelain and how it could be used on current and future projects. It also presented a great opportunity for everyone to see different perspectives, learn new approaches and meet other design-minded individuals. This unique collaboration of companies was held at our showroom based in Branksome Business Park in Poole, Dorset and is the first of a number of events that PietraCasa will hold over the year. If you would like to attend future events, please contact us on +44 (0)1202 618 155 or email studio@pietracasa.uk. Our showroom is open throughout the week, so please feel free to visit us to discover the potential of porcelain. Our sister company’s studio, Abitalia South Coast can also help with any design enquiries, whether it be for porcelain or for the finest in contemporary furniture. For more information visit https://www.abitaliasouthcoast.co.uk/. Click on the link to view our Instagram footage of the event. Bas Relief for Mutina, designed by renowned designer, Patricia Urquiola, is an artisan-produced work of different variations and depths, influenced by traces of the past. In this handmade collection, designed primarily for wall use, the theme of the bas-relief comes to life in several versions and depth. Shades are natural and neutral. The four styles within the collection, while all textured and bold, are extremely different from one another. 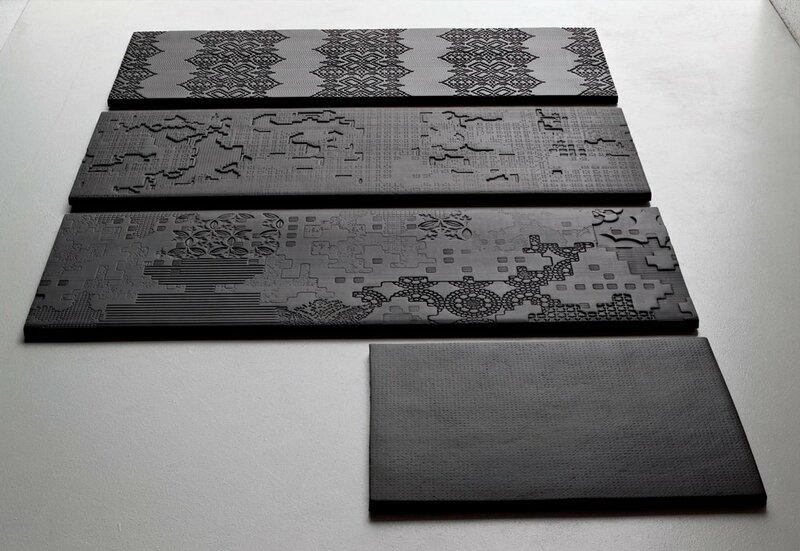 Each pattern has a seemingly pixelated look to it, this "digital" aesthetic contrasts with the handcrafted, slightly irregular edge of the tiles themselves. All items in the Bas Relief Collection are available in 3 colours: Bianco, Cipria and Nero. Here at PietraCasa, we supply and sell the entire Bas Relief range by Mutina. For further details regarding any of PietraCasa's beautiful porcelain tiles or to speak to one of their experienced team representatives for additional information, please click here where you'll be asked to fill in a short online contact us page along with details of how to locate PietraCasa directly on google maps. Alternatively, you can call us directly via tel: +44 (0)1202 618 155 or email: studio@pietracasa.uk. The K2 Range by Ceramiche Keope is suitable for a raised installation or dry installation on sand, gravel or grass to take advantage of a floor that can be used immediately, without the need of screed or use of adhesive or mortar. Alternatively, the K2 range can be installed in the conventional manner on a screed, using adhesive to guarantee an exceptional resistance to breaking loads for high-traffic surface areas. The versatile K2 complete range of 20mm thick porcelain stoneware tiles fulfils the needs of any contemporary design. The strength of the K2 stone decorates outdoor spaces with its natural beauty to create a variation of both welcoming and fascinating outdoor spaces. The K2 range has been designed for indoor and outdoor spaces to guarantee the best in terms of stylistic consistency and definition. Here at PietraCasa, we supply and sell the entire K2 range by Ceramiche Keope. For further details regarding any of PietraCasa's beautiful porcelain tiles or to speak to one of their experienced team representatives for additional information, please click here where you'll be asked to fill in a short online contact us page along with details of how to locate PietraCasa directly on google maps. Alternatively, you can call us directly via tel: +44 (0)1202 618 155 or email: studio@pietracasa.uk. Here at PietraCasa, our Porcelain benchtops are made of high-density, low-porosity ceramic slabs. Porcelain is a new material to be used as surfacing in the kitchen and may well be the product that ends our love affair with quartz-based stone. Many of the properties that make quartz-based stone so popular are also present in porcelain, with a few superior properties quartz-based stone does not have. PietraCasa's Porcelain benchtops are made of powdered clay and coloured pigments bonded together at extremely high temperature and pressure.Due to the fine particles used the surface can be formed with different textures, from smooth to bumpy. Designs can be printed onto the surface to mimic a range of materials from wood, concrete, marble and limestone. 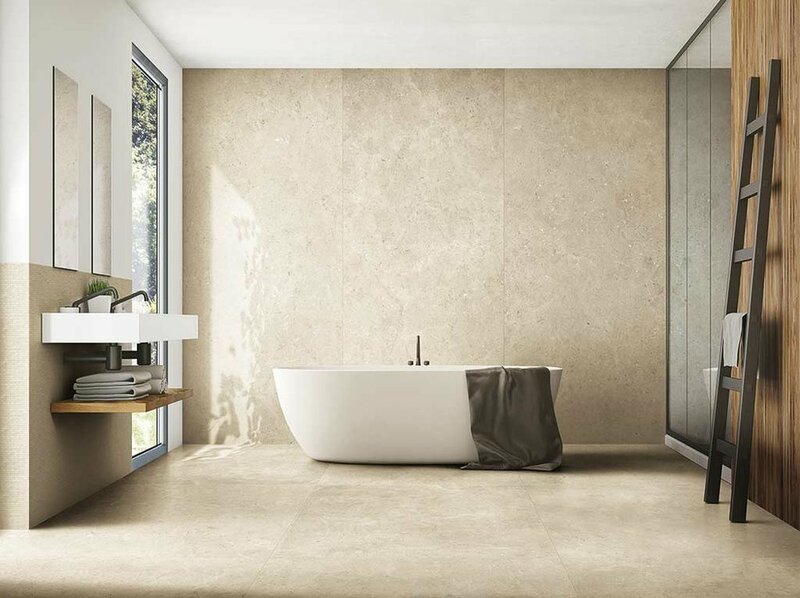 Here at PietraCasa, we supply and sell an impressive range of Luxury Large Format Porcelain Tiles. For further details regarding any of PietraCasa's beautiful porcelain tiles or to speak to one of their experienced team representatives for additional information, please click here where you'll be asked to fill in a short online contact us page along with details of how to locate PietraCasa directly on google maps. Alternatively, you can call us directly via tel: +44 (0)1202 618155 or email: studio@pietracasa.uk. 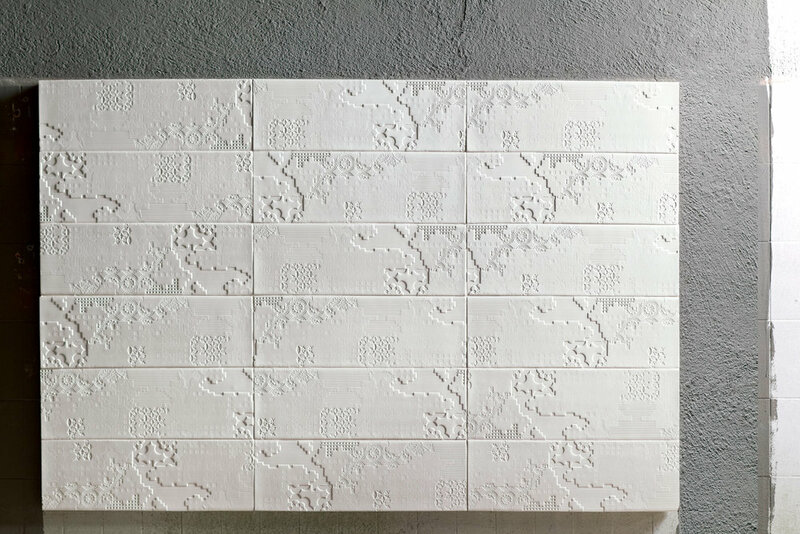 PietraCasa becomes the latest dealer of Mutina porcelain ceramics. The Italian brand Mutina takes porcelain into a new dimension by approaching the industry as artists and designers rather than a tile manufacturer. The result is an innovative high-quality product for contemporary interior spaces. From the outset in 2006, Mutina ceramics are objects of art in themselves, not a representation of another material. The realisation of texture, form, shape and colour make for beautiful surfaces in interior environments such as bathrooms, kitchen splashbacks or feature walls. Patricia Urquiola, a formidable designer, has introduced a number of collections including Déchirer and Cover which are particular favourites of ours, that bring a new approach to depth and texture. Handmade tiles act as the signature of the designer, each one with its own nuance and character. Underlying each collection is new technology in a traditional industry. The complete collection is available from PietraCasa with a selection of our favourites on display at our showroom in Poole, Dorset. Open to both private and contract clients, our team welcome you to see firsthand the beauty and scale of Mutina. Serving clients in the south west of England, we deliver tiles across the country for projects of varying scales. Contact PietraCasa for more information on Mutina ceramics. The following video gives a real insight into the mentality of Mutina and why we enjoy collaborating with them.